My blog is pretty simple this week. We came home to Phoenix and basically we did nothing. Well, I did nothing! My wife did a lot; she caught up on bills and paperwork and all that. I worked around the house a little bit and cleaned the pool, played with TJ, but not a whole lot. TJ actually went to day care for a couple of days with all his friends down there and I worked on some tackle stuff and some maps trying to figure out where we’re going next. It’s not too stressful this week and that is pretty nice. I just wanted to thank Reaction Innovations because they let me keep my motor home there this week and they gave me a nice place to keep it out of the way. We’re flying in and out of Birmingham; flying in there on Wednesday and we will be at the Mark’s Outdoors Tournament on Friday and Saturday. This is a huge tournament with about 500 boats in this tournament that they have every year. 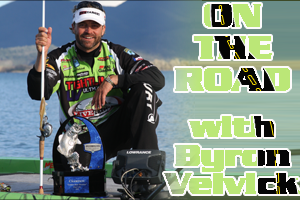 I fished it last year and it was just a lot of fun with a lot of family entries in it. Last year it had probably 100 father/daughter, father/son type entries and is just a good event to see. It is a little crazy trying to fish a tournament in those conditions, but it is fun with all the activities and the tackle giveaways around it are just a good time! That’s our plan, we’re going to fly into Birmingham, and we will go attend that and then will go to West Point, Georgia next week, kicking off the rest of the season. I am looking forward to it: with a win and you are in and you are never out of it this year to make the Classic. That is my goal, to still make the Classic and keep moving up. So, had a great little break, but I’m ready to get back to fishing!